Help Those with Cancer Association (Tulips) on Thursday 17th October in Girne. We have now heard that this was a huge success and have had the following report of the event from Carole and Sue which we are passing on to our readers. stall. 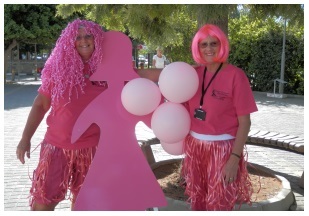 We were all dressed in Pink with wigs and hawaiian skirts to match (including our one intrepid male, Mike Bezzant – what a star!) 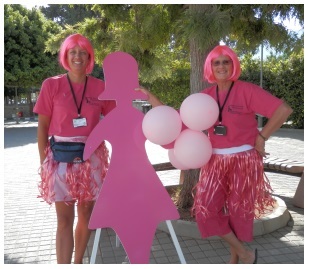 and then we set off through the town and around the harbour areas to collect money in our Pink Tins for Breast Cancer Awareness Month. 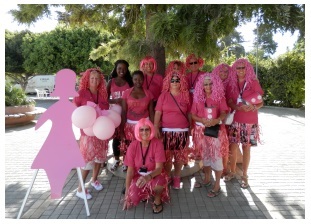 bout 3.30 and a very weary but elated bunch of pink volunteers made their way home. 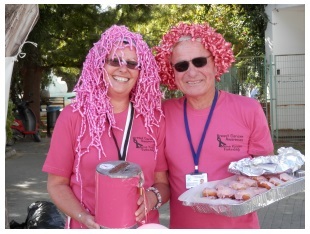 A big thank you to the Food Lodge who donated over 100 pink donuts for us to sell on the day on our stall and we appreciate their hard work in getting them all ready for an early start. Their support is so much appreciated. Friday, 25th October is Wear Something Pink Day, so don’t forget if you are going out and about to wear something pink and donate what you can to Tulips.